With the turning of the earth on its axis the seasons change. In the northern hemisphere the length of the days begins to decrease, the trees take on a dress of yellow and red, and flocks of birds gather for their long journey to warmer climes. In trout streams from Montana to Maine brown trout and brook trout are dressed in spawning colors and thoughts of love or lust turns the most timid brown into a fighting machine. When I came to Montana 35 plus years ago fall fishing was the beginning of the second season in the mountain west. There was a dedicated group of anglers that waited all year for the last few months of the year to drag out the big rods, sinking lines, and monster streamer flies. They would stand waist deep in icy cold water throwing shooting heads into deep pools on the Yellowstone or the upper Missouri. The flies they used were monsters, 2's and 4's, 3 and 4x long shank heavy wire hooks with a half a chicken lashed to the shank, or all the deer hair from a medium sized deer spun around the head. There were light and dark spruce flies, muddlers, both regular and marabou style, spuddlers, and a variety of bucktails. A good day of such fishing might result in only one or two fish hooked and landed, but when things were right these would be bragging fish. Hooked jawed browns, golden brown and covered with red spots the size of quarters. Occasionally a slab sided rainbow lurking around the tail of the pools hoping to score some brown trout roe would grab your offering, and like a landlocked steelhead would lead the angler on a tail-walking run down the pool. My friend, the late Joe Brooks, was one of the pioneers in publicizing the fall streamer fishing in the Rocky Mountain West. 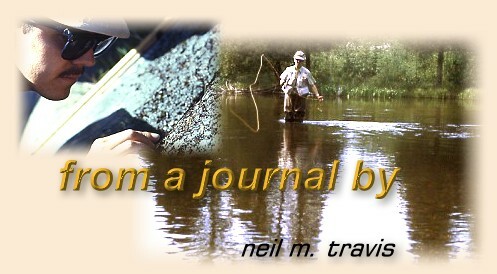 His last book Trout Fishing was published in 1972 just two years before he died, and it contains a lengthy section on fishing for autumn trout on rivers in Montana. The information that he provided about this style of fishing is still worth reviewing, and the stories that he relates about fishing during those days is worth the price of the book. Most of the old time anglers that haunted the pools of autumn slinging huge streamer flies beneath mountains capped with the first snows of the impending winter have long since gone to their eternal reward. Recently I came across several boxes of big streamers that were given to me by Mary Brooks after Joe died. I dumped the flies out on the table and examined each one before putting them back into the box. As I stroked the feathers and smoothed out the hair on each pattern I could feel the push of the Yellowstone on my legs, and feel the surge of a brown trout lunging away downstream with one of these huge flies hung securely in the corner of his jaw.